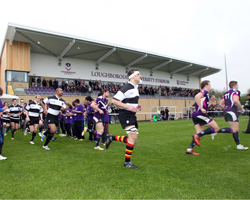 One of the biggest sporting names has visited campus to play a celebratory rugby match in the new Loughborough University stadium. The Barbarians, coached by one of the University’s finest graduates Andy Robinson, played against Loughborough Students RFC - Champions of National League 2 North. Despite the difficult weather conditions a large crowd turned out to watch both teams who were intent on playing running rugby. The Barbarians took an early lead through former Great Britain rugby league centre Sean Long who crossed for a try. Nottingham’s Japan international fly-half James Arlidge added the conversion. Loughborough matched the Barbarians for almost 20 minutes before John Carter and Chris Budgen scored converted tries for the visitors. However at the end of the first half Russell Weir, Loughborough’s scrum-half and captain, gave the home fans plenty to cheer about as he took a quick tapped penalty and scored a try. A conversion from Andy Hall took the half time score to Loughborough 7 Barbarians 21. The second half saw great resistance from the Students before a second close-range try from Budgen proved decisive. Late tries from Phil Chesters and Ross Broadfoot gave the Barbarians a 40-7 win. During the half time break the University was awarded with two accolades in recognition of the contribution that Loughborough has made to student rugby. Ian Elvin, Chairman of the Students RFU, presented a silver salver for the outstanding contribution made by the club in volunteering through the BOOST project, as well as achievements in participation and performance. Bob Reeves, Vice President of the Rugby Football Union, presented a plaque to recognise the all-round contribution that Loughborough has made to English rugby and for enhancing the image of university sport across the whole rugby community. “It was very hard to play rugby in the weather tonight. I’m disappointed to lose, but it was a fantastic occasion to play against the world famous Barbarians. “It’s an awesome stadium with a real buzz about the place and lots of our old players coming back to support us tonight. We also had a real mix of the local community and students down here which we are keen to encourage and provide a great match day experience. Plans for the forthcoming 2012-13 season, in which the Students will play in National League 1 for the first time, are already in place. As with previous years the Students will play teams in a higher division to prepare them for the season ahead. Pre-season matches will be played against teams in Championship such as Cornish Pirates, Nottingham, and newly promoted side Jersey. It was awarded the coveted Sunday Times University of the Year 2008-09 title, and is consistently ranked in the top twenty of UK universities in national newspaper league tables. In the 2011 National Student Survey, Loughborough was voted one of the top universities in the UK, and has topped the Times Higher Education league for the UK’s Best Student Experience every year since the poll's inception in 2006. In recognition of its contribution to the sector, the University has been awarded six Queen's Anniversary Prizes.